Six-thousand-two-hundred-sixty-two miles. Man, that’s a long time between fill-ups. But that’s the maximum statute-mile range I computed for Cheoy Lee’s new 68 Serenity, a 116,000-pound full-displacement trawler that dares you to single up all lines and chase that sunset. 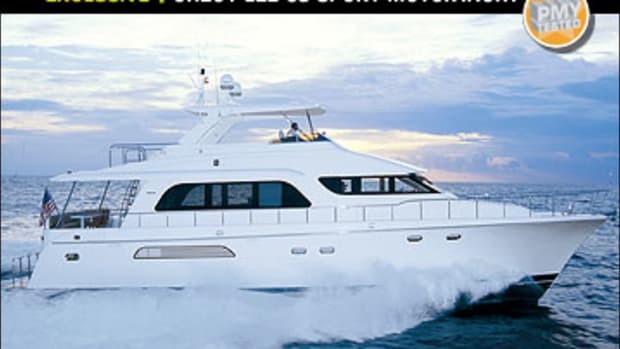 I computed her range based on the boat’s standard 2,350 gallons of diesel and a 1000-rpm speed of 7.7 mph (2.96 mpg). Man, that’s a long time between fill-ups. But that’s the maximum statute-mile range I computed for Cheoy Lee’s new 68 Serenity, a 116,000-pound full-displacement trawler that dares you to single up all lines and chase that sunset. I computed her range based on the boat’s standard 2,350 gallons of diesel and a 1000-rpm speed of 7.7 mph (2.96 mpg). Crank her optional 315-mhp Caterpillar C7s (330-hp John Deere diesels are standard) to WOT, which is 2440 rpm, and the 68 will hit an average top speed of 13.7 mph. At this speed, her range is reduced to 894 statute miles (0.42 mpg), but that’s still pretty damn far. 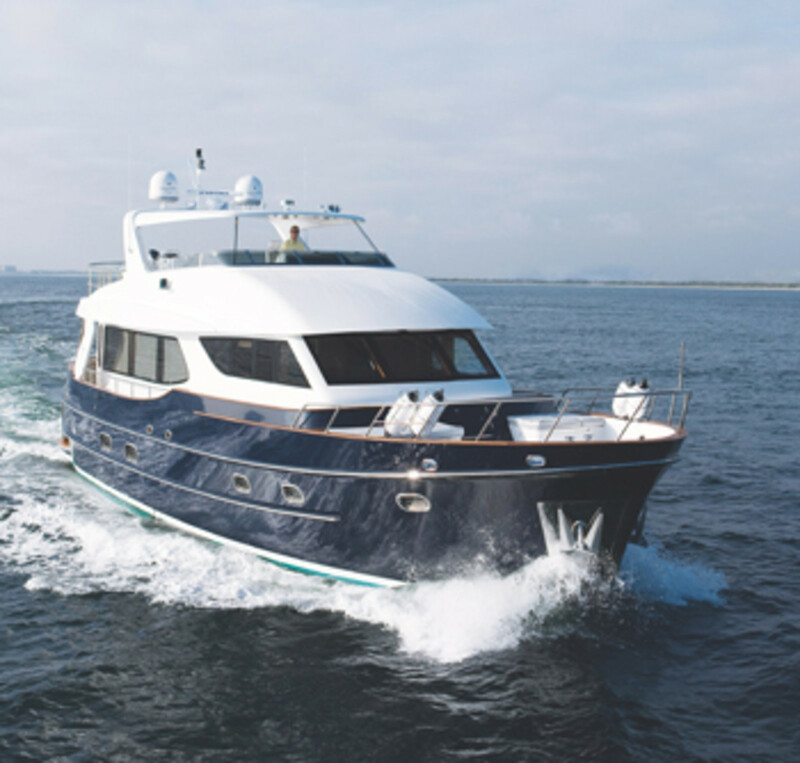 The 68 is a voyager at heart and comes from a 239-year-old, family-owned boatbuilder that has spent that time honing its skills by constructing vessels for all sorts of serious bluewater duty. Indeed, Cheoy Lee, which is based about 60 miles from Hong Kong in Doumen, China, has built more than 5,000 vessels since World War II alone. 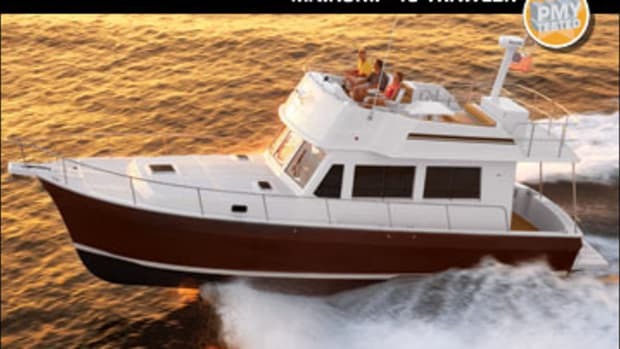 In addition, it has a wealth of experience building boats for both the pleasure and commercial sectors using a variety of materials, including fiberglass, aluminum, and steel. A plethora of push tugs, ferries, offshore platform-support vessels, motor-yachts, and even sailing junks boast a Cheoy Lee pedigree. This is one builder that really has done it all, and it has poured that experience into the 68. This is actually one of the company’s smaller offerings (it currently builds recreational boats up to 150 feet), and she sports a look and layout that are the result of an international collaboration. 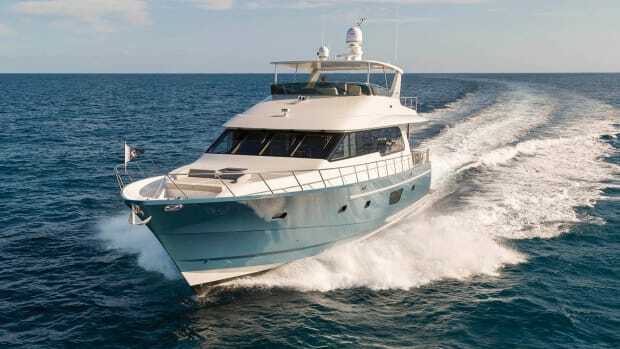 Florida-based naval architect Mike Burnevich drew the round-bottom hull form, complete with canoe stern while New Zealand’s High Modulus completed the structural engineering and Australia’s David Bentley Industrial Engineering created the exterior styling. Washington State-based Sylvia Bolton came up with the 68’s interior look, which features warm, expertly grain-matched teak. Mahogany, African khaya, anigre, figerosa, cherry, and more are no-cost options. 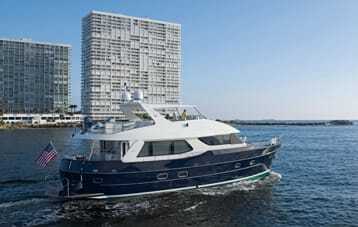 This is by no means the first time Cheoy Lee has collaborated on one of its yachts. In fact, a long list of well-known naval architects, including Jack Hargrave, Tom Fexas, Don Shead, and Frank Mulder, has drawn vessels for it. But regardless of who was involved in what part of the world, it’s the yard in Doumen where the idea of the 68 became a reality. And it all started with a resin-infused, solid-fiberglass hull bottom. Adding structural integrity are integral fiberglass fuel, freshwater, and holding tanks. To save topside weight and keep the boat nearly silent underway, Divinycell coring is laminated into the decks, bulkheads, and internal soles. 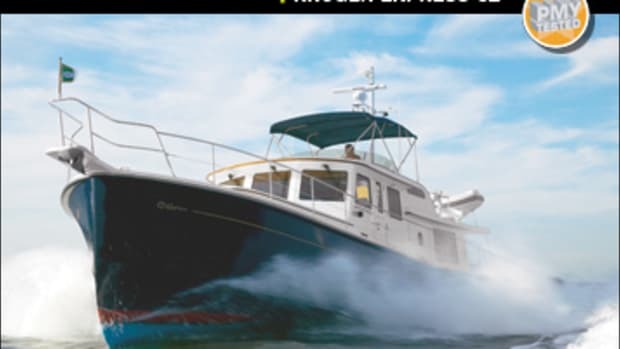 Further enhancing the boat’s quiet nature (maximum decibels at the flying-bridge helm never exceeded 72 dB-A), is a Majilite headliner, a material comprised of super-thin nylon fibers that are said to be as durable as leather. Because it’s microporous, Majilite absorbs sound and dissipates heat and moisture too. One place that was particularly quiet underway was the lower-helm station. I could barely get my decibel meter to read in the mid-50s there. But while I couldn’t hear much (especially outside noises due to the two heavy-duty fiberglass doors that flank the helm and lead to the 20-inch-wide side decks), I could see over the 68’s Portuguese bridge and foredeck quite well. The reason is that unlike some older Cheoy Lee models that have small windshield panels (usually five) and therefore multiple mullions, this vessel sports three large panels; two outside ones that measure 37"Wx40"H, and a centerline panel that’s 44"Wx40"H. Visibility is also helped by the fact that there’s little bow rise: my inclinometer never rose above 2 degrees. The 68 was also designed for safety. If you need to exit the helm and go forward while dropping one of the two anchors via the Maxwell double-windlass system, or if you just want to hear the ocean, you’re protected by high bulwarks all the way. I measured them at 2&apos;3" high amidships, and they stood as high as 3&apos;4" around the helm area. It’s a great safety feature for the cruising family with small children. The 68 was built solid, and that’s exactly how she felt underway. While I would’ve liked to see her run in some rough stuff, all Mother Nature offered up on test day was a paltry two-foot sea. It wasn’t anything the 68 couldn’t handle with ease, even without her standard nine-foot Naiad fin stabilizers activated. At all speeds, she responded quickly to input from her wheel. Teleflex Hynautic hydraulic steering, the ZF gears’ deep 2.50:1 reduction, and 33x23 five-blade wheels all worked in concert to offer a smooth handling at all speeds and gentle transitions while turning. In fact, to spin her 360 degrees, I employed her standard 16-hp Side Power bow thruster only for fun. She spun with wheel alone and little input from the Mathers MC2000 electronic controls. For tight docking scenarios, there’s also a standard ZF wired remote, a good idea as sightlines aft and to the sides are restricted thanks to the cockpit overhang and her centerline helm station placement. 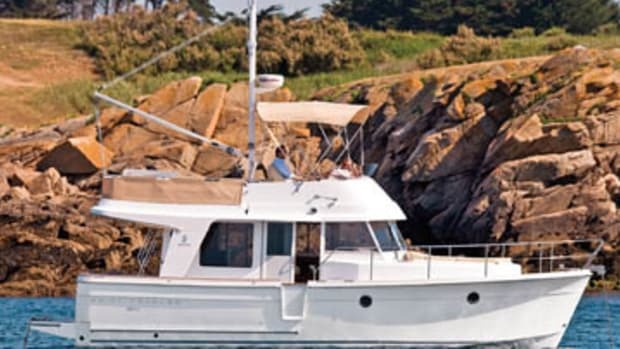 However, that overhang does provide a nice place for the standard Nautical Structures 1,500-pound davit and 15-foot Nautica tender, which will come in handy for those shore-side sojourns during your sunset-chasing adventures. 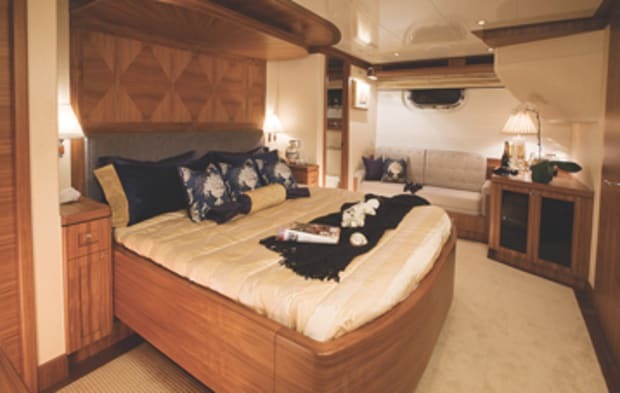 During long voyages, luxury will be the call of the day as the below decks of the 68 calls for easy living. 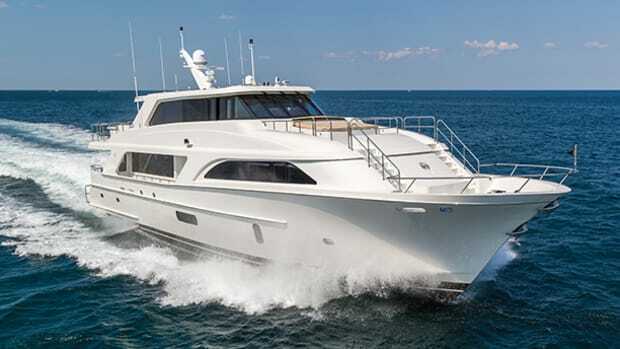 The full-beam (18&apos;0") amidships master sports a king-size berth. Its en suite head has a surprisingly large bathtub, about 43"Lx18"H. To enter it requires you to negotiate a 20-inch step, no doubt there to keep water from sloshing out in a seaway. Still, at 5&apos;7" I found it a stretch to get into the tub. Aft the master is a double-berth guest stateroom, which can also be outfitted as a media room (I like that idea). 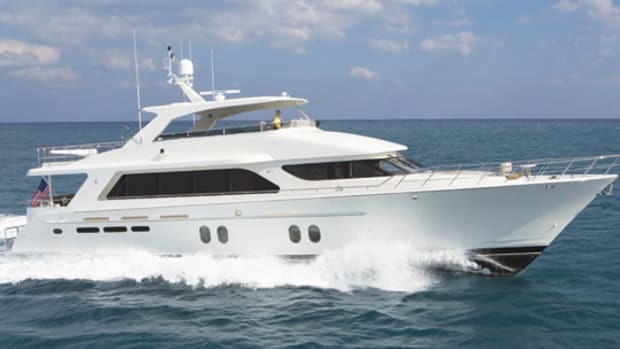 A forepeak VIP offers guests a double berth and the crew stateroom aft of it with bunks rounds out the well-appointed accommodations, which includes Headhunters MSDs in the four heads and Sharp LCD TVs in the staterooms. The joinery here features intricate nautilus shell designs in the companionway sole and is of artisan-quality. The same level of woodwork is found in the saloon and galley. In the interest of full disclosure, traveling at seven knots, or even 13, isn’t really my thing. (Do I hear 30?) 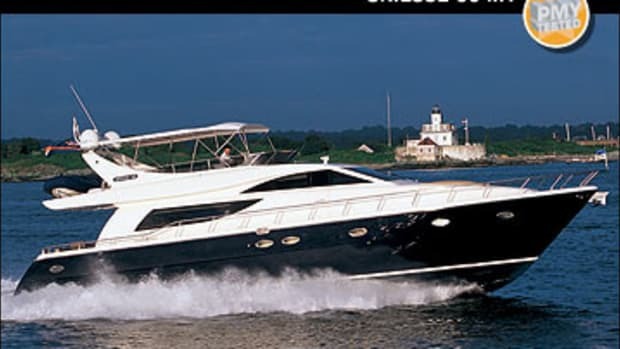 But on this boat I learned to appreciate why slow cruising over long distances is so appealing to so many boaters, especially when it’s on a vessel as well constructed, outfitted, and designed as the Cheoy Lee 68 Serenity. 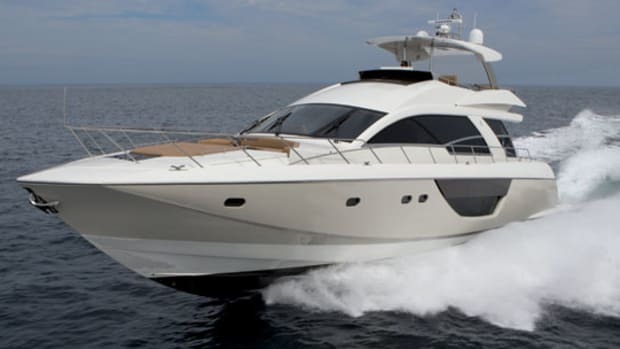 She’s a pedigree yacht that’s purposeful in look, performance, and handling. And let’s face it: being able to travel more than 6,000 miles non-stop is just plain cool.